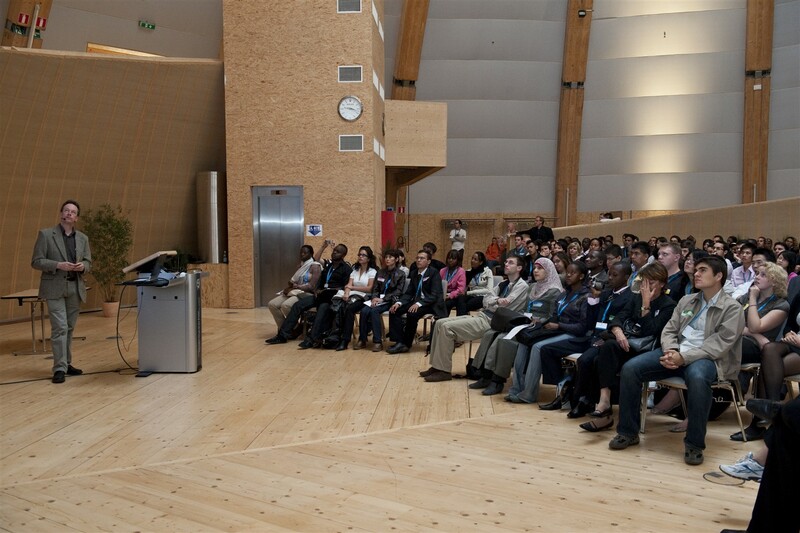 About 250 students selected by the International Telecommunication Union (ITU) to participate in the 2009 Youth Forum made CERN a primary destination for this year’s World Youth Forum event. The 250 students participating in the 2009 Youth Forum attend a presentation in the Globe of Science and Innovation. On Tuesday 6 October, the group visited several sites including the Microcosm exhibition and the ATLAS cavern to get a glimpse of what CERN does and the exciting science that is studied here. Since 2001 and every three years, the ITU World Forum brings together young men and women, aged 18-23, to learn about new technologies and the world around them. This year’s group included participants from one hundred and twenty-five different countries. This was the first time that the event involved a visit to CERN. When asked why CERN was a destination, Pascal Biner, organizer of the visit for ITU, explained that CERN was a necessary stop given the Forum’s base in Geneva this year. "For Geneva, [CERN] is really important. It’s really representative of Geneva… it’s like the jet d’eau." Pascal also explained that though the visit was brief, he hoped that it would be a starting point for its visitors to "go forward and find out more about CERN for themselves." For their part, the participants appeared to enjoy the visit. One young man explained that his favorite part was the reconstruction of the accelerator in the Microcosm exhibition. Regarding his experience at CERN overall he observed, "It’s good, it’s like a museum only it’s not… it’s better than a museum."